Special Web Marketing Offer - A unique opportunity to try out the web technology used by large corporations: E-mail Marketing, SEO Audit, Pay Per Click Account. We run your campaign - you get the results! Your Branded E-mail message created for you. Sent to upto 5,000 recipients provided by you. We advise you who receives, opens and clicks-on your message. If you are interested in purchasing elements of this bundle separately, please let us know. 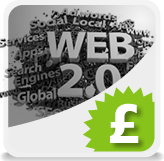 This Special Web Marketing Bundle is an one-off service for your website without ongoing costs and services. No number of clicks guaranted. We advise use of this bundle for SME's with online presence based on websites with up to 30 pages, with an enquiry system and brading in place.